The tradition of the Wealth Treasure Vase is a very ancient one. The Vases were very well known in Tibet for centuries, and many families had them. The Wealth Treasure Vase (Norbum) brings blessings to its possessor. The powers of the Vase are concentrated in the building where it is placed, serving to increase the spiritual and material wealth of the residents. Traditionally, the Vase was considered to protect from the negative influences of both human and non-human beings. It protected from fears of life and death. It strengthened karmic connections so that the obstacles to material gain and prosperity were eliminated. It also improved the spiritual environment so worldly and transcendental accomplishments were more easily obtained. The Vase provided material wealth and spiritual wealth; if one increased, the other did too. It is an axiom of Tibetan Buddhism that it’s good to fulfill your desires as long as you do not harm anyone else. Obtaining what you want brings a great deal of self knowledge. The Wealth Treasure Vase evokes the inexhaustible wealth within us all. 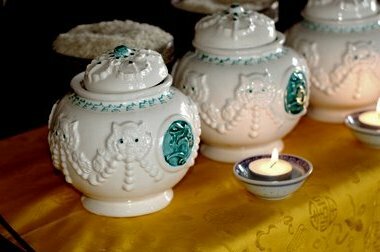 The Vases are empowered by the practice of White Mahakala. This practice is from the Shang-ba Kagyu lineage, and originated with the Indian mahasiddha Rahula Gupta. Trub Chen Kyong-Bo Naljor, one of the most important of the Tibetan born mahasiddhas obtained it from him. Trub Chen Kyong-Bo Naljor became very famous for his wealth and established a large monastery of the Shang-ba Kagyu sect. Lama Kunga Rinpoche does a series of pujas which empower the Vases. He meditates himself as the deity. He holds a Vajra with a red thread tied to it which encircles the mass of Vases on the altar. He transmits thought images to the Vases through the thread, invoking Bodhisattvas, higher spirits and wealth deities. The outer manifestation of the Wealth Treasure Vase is as a vessel containing many precious substances such as gold, silver, jade, amethyst, lapis, agate, onyx, pearls, crystals, pyrite, shells, and turquoise. It contains grains such as peas, lentils, rice, etc. ; all kinds of good things that beings like. It has pictures and mantras of wealth deities, and it contains a small image of White Mahakala. The inner nature of the Vase is as a celestial palace in which dwell, among other beings, six aspects of Avalokitesvara, the Bodhisattva of compassion, Vajrapani, Jambala, Kurukuli, Kuvera, the Northern King, Nor Gyun-Ma, Sadag Wangchen, the mighty earth protector and the great Naga kings. Residing over these deities is the White Mahakala, the supreme god of wealth. The secret nature of the Vase is the state of a happy and contented mind, the elimination of evil and the increase of goodness.